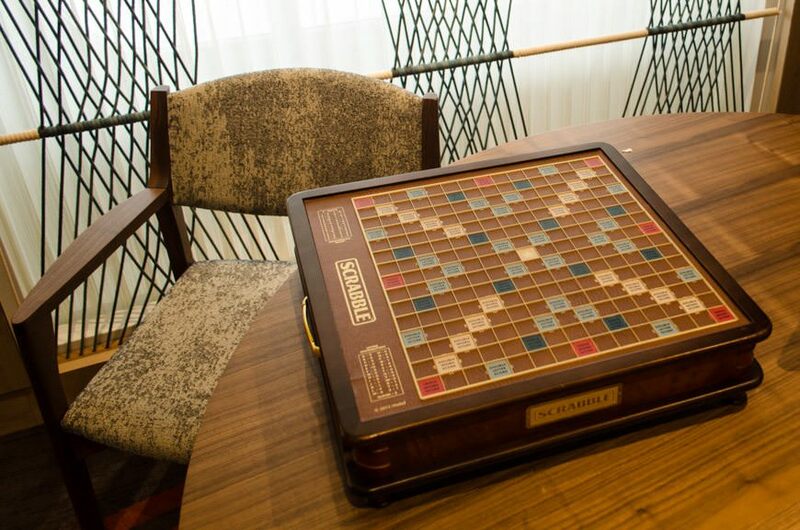 Founded in 1997 by industry veteran Torstein Hagen, Viking River Cruises is the parent company of oceangoing offshoot Viking Ocean Cruises, and from the outset, Hagen’s mission was a simple one: to bring river cruise style amenities and inclusions to oceangoing cruise ships. 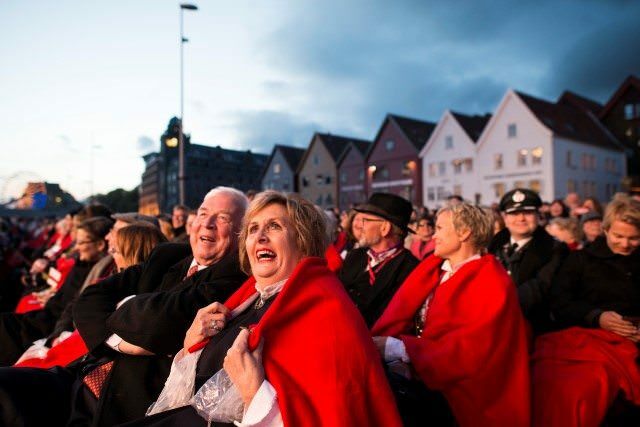 Viking Cruises chairman Torstein Hagen, left, and Bergen mayor Trude Drevland, right, take in the concert at the christening. Photo courtesy of Viking Cruises. Complimentary beer, wine and soft drinks with lunch and dinner. One complimentary excursion in nearly every port of call. Complimentary access to the Thermal Suite in the Nordic Spa. Complimentary dinner reservations in all venues. Complimentary stem-to-stern WiFi internet access. 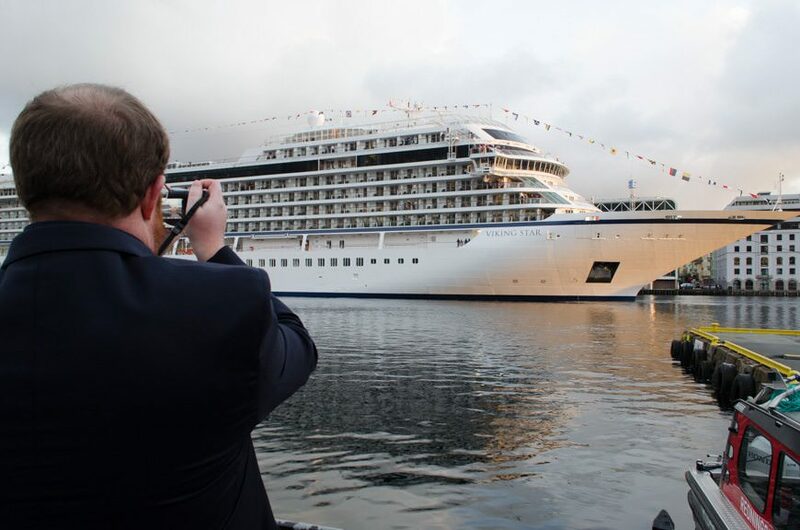 Viking Star is flagged in Norway and registered in Bergen. Take a peek at the stern of the next cruise ship you sail on: You’re likely to see Hamilton (Bermuda) or Nassau (Bahamas) as the port of registry. These are called “flags of convenience,” and typically translate into lower fees and more relaxed regulations. 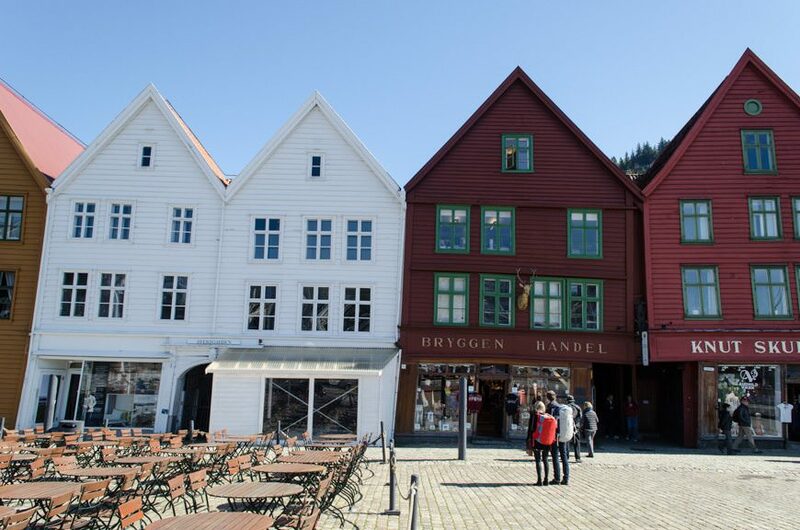 But because she’s registered in Bergen, Viking Star can proudly carry her Norwegian heritage with her to the farthest corners of the world. That, too, is significant. By 2022, Viking Oceans will have a fleet of six 930-guest passenger ships that are, at this point, scheduled to be more alike than not. However, considering the success Viking has had with its lead ship, Viking Star, this is a good thing. Read our full Voyage Report from the christening of Viking Star in Bergen, Norway; and from our journey between Barcelona and Lisbon. Viking Star. Launched May, 2015. Viking Sea. Setting sail March, 2016. Viking Sky. Setting sail January, 2017. Viking Sun. Setting sail May, 2017. Unnamed 1: Due November, 2020. Unnamed 2: Due January 2022. Currently, Viking Oceans offers voyages throughout the Mediterranean, Western Europe, Northern Europe, the Baltics and Norway. 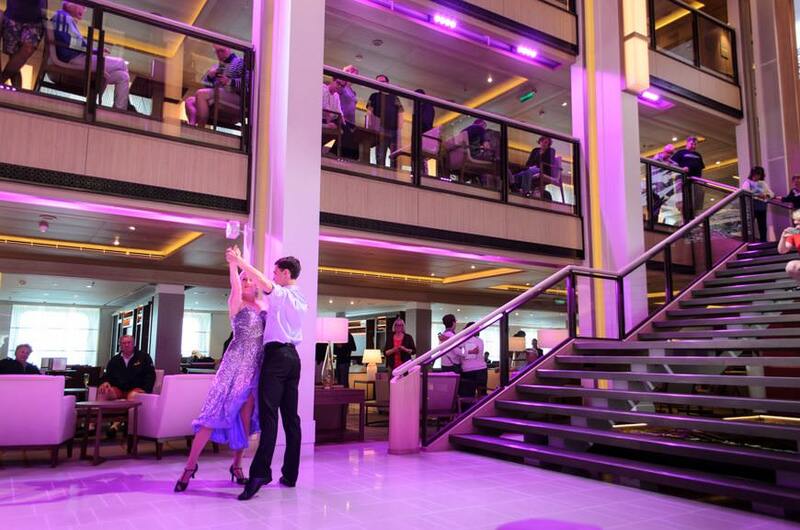 Beginning in September of 2016, the all-veranda, 930-guest Viking Star sailed a unique transatlantic voyage from Bergen, Norway to Montreal, Quebec. The 15-day journey marked the first time that Viking Star sailed to North America. The westbound transatlantic journey offered calls on the Shetland Islands; Faroe Islands; Iceland; Greenland; and Newfoundland. 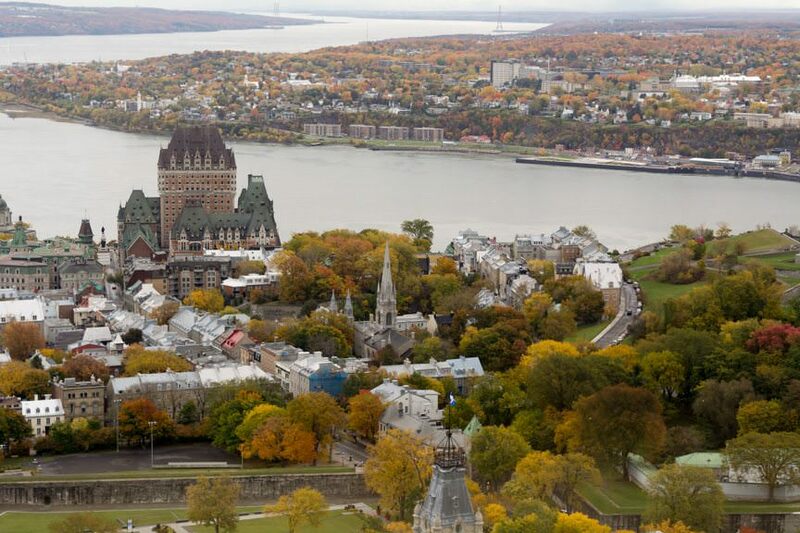 The journey concluded with numerous calls in Quebec, including visits to Saguenay Fjord, Quebec City, and Montreal. Viking Star will also set sail for the eastern seaboard of the United States and the Caribbean. On October 2, 2016, Viking Star sails on a 13-day Canada & New England journey from Montreal to New York City, featuring port calls in Quebec City, Halifax, an overnight stay in Boston, and even scenic cruising of New York’s rarely-visited Cape Cod Canal. After that, it’s off to the Caribbean. Viking Star will sail for 15 days to the West Indies, arriving in San Juan, Puerto Rico after calling on Newport, Rhode Island; Baltimore, Maryland; Norfolk, Virginia; and Port Everglades. Sister-ship Viking Sea makes her home primarily in the Mediterranean and Northern Europe. Viking Sky will offer similar sailings when she debuts in January of 2017. Routes for future ships have not yet been announced. Guests who appreciate value and inclusive features. Viking doesn’t ‘nickel-and-dime’ guests. 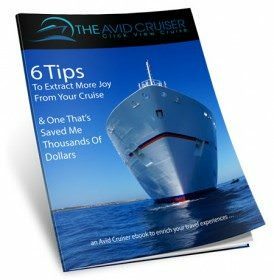 Cruisers who love the idea of being at sea. Viking’s oceangoing vessels are filled with wide-open decks and plenty of windows to let in ocean vistas. Travelers who appreciate history and culture. Viking’s itineraries are a compelling mix of popular ports of call and off-the-beaten-path locales. If you need constant activities and a barrage of loud music and flashing lights, this isn’t the cruise for you. Families with Kids: there are better options out there that cater to multi-generational families. The Viking Oceans experience is a decidedly adult one. Casino lovers: Viking’s ships don’t have one. Also see The Second Coming Of Torstein Hagen Full Circle In Bergen. 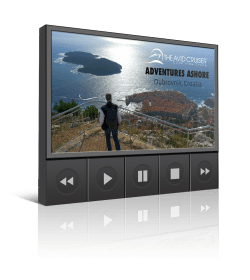 Want Help With Your Viking Oceans Cruise? Thanks so much for your very informative site. I’ve sailed on a Viking River Cruise (Paris to Normandy) and we’re booked on the Star for Feb 2016 (Rome to Barcelona.) However, I was disappointed to find recently that motorized scooters are not allowed. I have a small one that can be assembled and disassembled in about 5 minutes. In January we cruised on the RCCL Quantum, and our regular, non-handicapped cabin accommodated it with no problem…and that was much smaller than a Viking Star regular cabin. I realize that the Star is much smaller than RCCL ships. However, I checked other lines and Azmara, for instance, has a ship smaller than the Star and they allow motorized scooters. I can walk short distances but it is difficult. Collapsible wheelchairs are allowed, but pushing me around will be hard on my wife. I realize it is more difficult getting around on scooters in certain international venues, but any savvy, mobility-challenged traveler can get around quite well. I just feel that a cruise line such as Viking, that markets largely to seniors should be more sensitive to their needs. I hope this resolves in a good way for you Bob. Please let us know upon your return. Thanks for letting us know about the scooter issue.